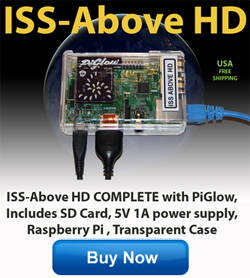 The PiGlow costs just $12.99 (from Amazon) (note: just increased to $20.37!!) so this will be one of the cheaper ways to implement ISS-Above. The video below will give you some idea of how the LED / Color displays tell you how long until the next pass of the ISS. This is what the LED’s do. Then… when the overflight is happening the LED color display will start flashing ALL DIFFERENT COLORS. Initially – as the ISS is on the horizon and far from you it will flash slowly but as it gets closer and higher in the sky it will start flashing/blinking faster and faster.